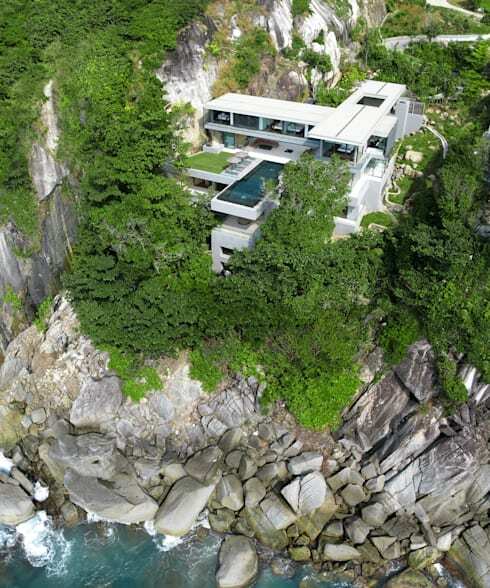 This luxury clifftop residence has to offer one of the most striking outlooks there is. 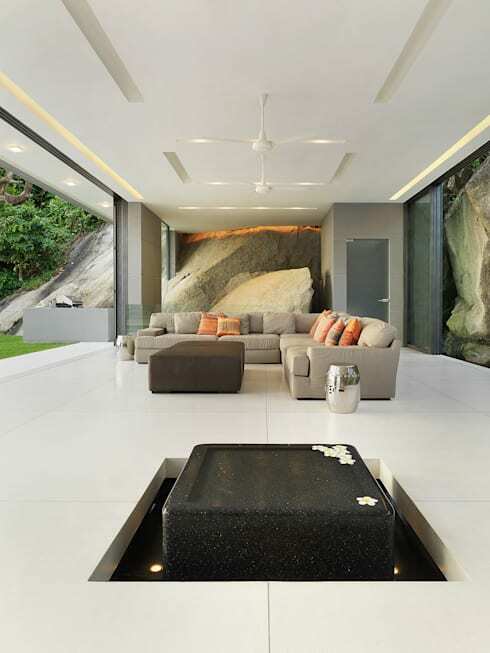 It seems that the architects behind this stunning home, Original Vision, are aptly named indeed. Facing straight out to the sea, it offers the ultimate escape from city life. And—of course—it does so in ultimate luxury as well. Here, we take a wander around the exterior and grounds of this mansion to die for. 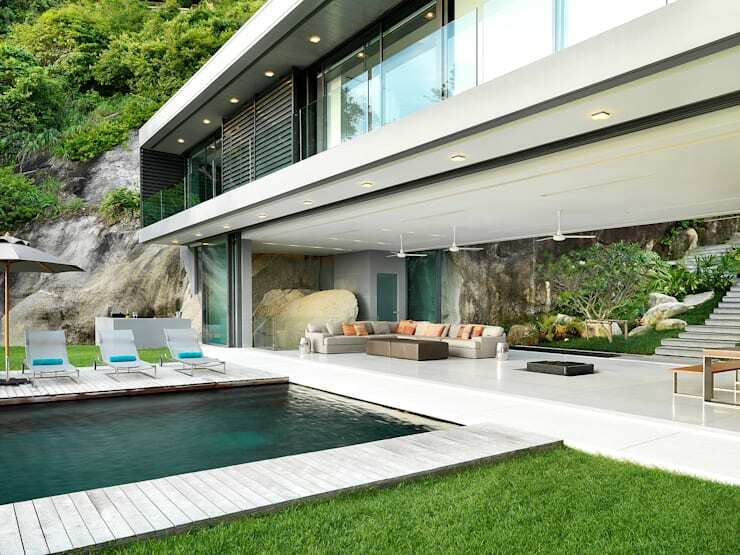 This ideabook originally stated that this house was located in Hong Kong. This mistake has now been corrected. As this photo shows, the house is a large one, and even from this far away it's evident that no expense has been spared in making this dream home a reality. But it's not the luxury, the size, or even the architectural style in itself that immediately makes this building so eye-catching; it's the perfectly selected location. So near to the cliff edge as to appear to be on the point of tipping into the sea, the house possesses a clear sense of drama that would be impossible to deny. It rises from the surrounding greenery like an object from a different world, as strange and unexpected as an abandoned science lab deep in the rainforest. The design of the house, of course, adds to this impression; being blocky, modern and distinctly unnatural. 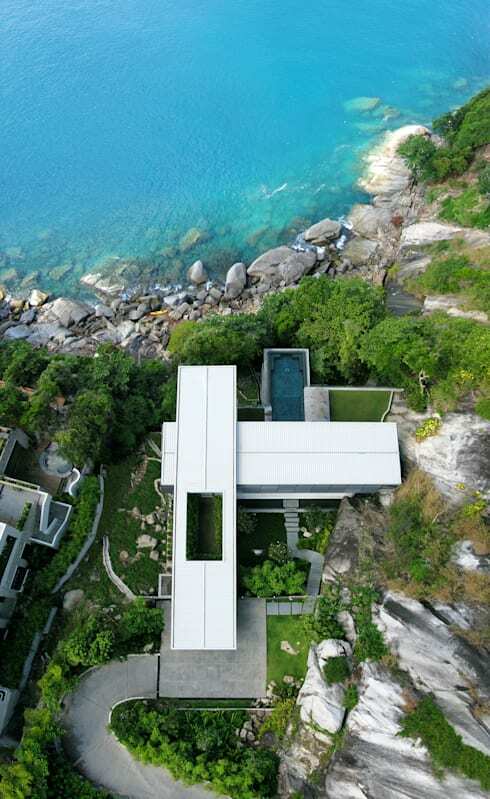 An aerial shot shows just how close to the sea this house truly is. It also gives a clearer idea of the strength of the contrast between the ordered bright white rectangles that make up this house and the unruly greens, blues and greys in the surrounding area. The infinity pool that protrudes from the centre of the house is one of its key design features, and no doubt one of its key selling points. With nothing to get in the way, it offers an uninterrupted view of the deep turquoise water beyond. It's a drop-dead gorgeous lesson in making the absolute most out of every feature of your project's location. The garden is cut neatly into the rugged rock that surrounds it, an oasis in the midst of untamed terrain. 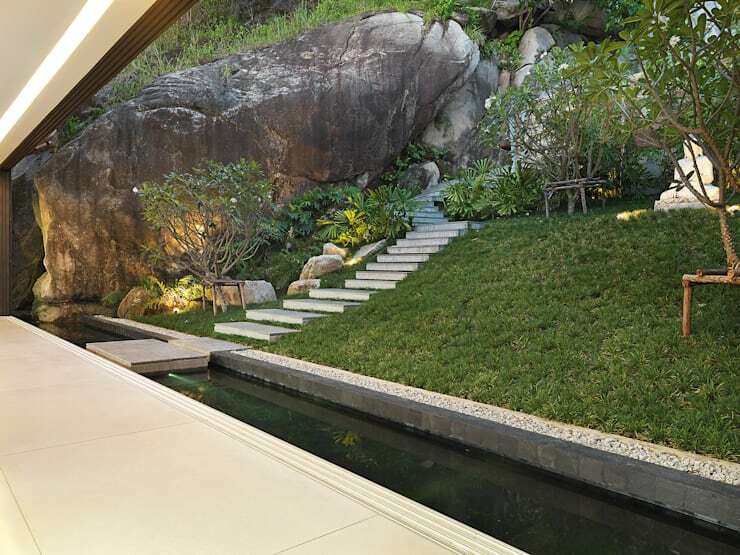 The upper portion of the house forms a shade for the seating area below, where sleepy swimmers can lounge, snack and contemplate their eventual return to the water. Because the pool and its surround are so completely flat, this seating area would also be a great place to sit and take in the view of the sea. Corner sofas are not only the most suitable for socialising, they're also the comfiest, just right for stretching out and relaxing. It's not that surprising, then, that a home as luxurious as this one would come equipped with one. also worth noticing in this picture is the way the building accommodates certain parts of the rock behind, allowing a welcome intrusion from nature. 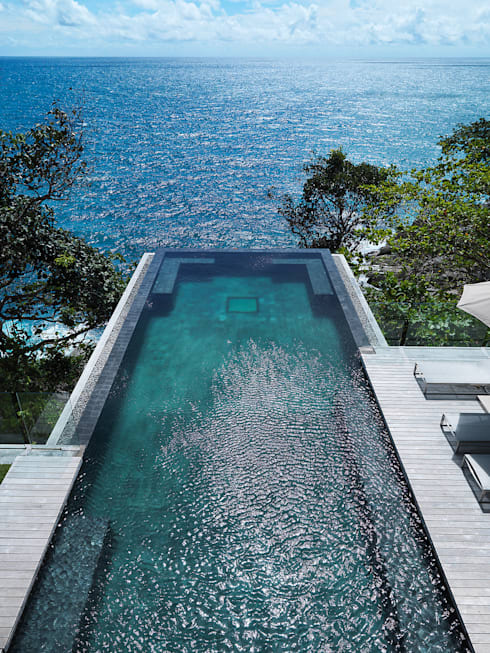 This photo shows that amazing infinity pool looking its very best. The attention to detail here is quite remarkable; even the water in the pool is a near-perfect match for the wild water that makes up the sea beyond. Swimming here below the rays of the sun, it would be easy to lose track of where you were and who you were… in the most pleasant way possible. 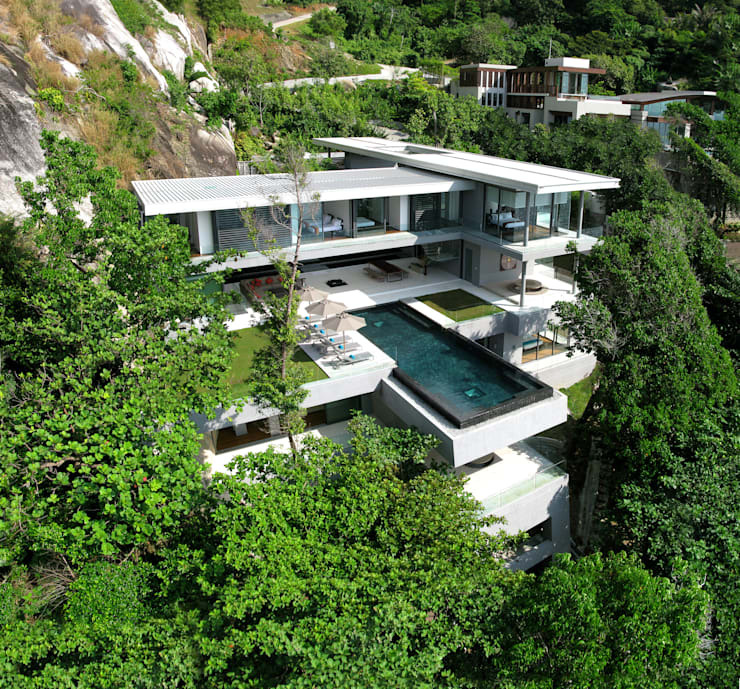 Tell us what you think of this clifftop mansion here!